Episode 11 : Searching for Dayo’s biological father. Cecilia decides she will not get married! Episode 12: Cecilia’s teeth get fixed! The beginning of the play. Episode 14: Dayo and Vivien get together. Dayo finds out the truth about Benz. Dayo and Cecilia Moment: Part 1 Part 2 These moments are taken from scenes where Dayo is trying to woo Cecilia in the earlier episodes. TVB Lighting Ceremony screencaptures: The cast from Men Don’t Cry come on stage to promote the series while putting on a skit show! Another good episode! As I had suspected, Dayo was only ‘pretending’ to have turned into a bad person again as planned with Wong Fei Hong so that he can get back to Ah Pao’s side to investigate about the missing people. Though a little unexpecting was the fact TVB revealed it so early on but I don’t mind =) We get to see Dayo and Wong Fei Hong’s conversation and Dayo’s real thoughts as they progress through the plan. Dayo also had to betray Vivien and lie to her again to make her forgive him, but then ‘drugging her’ and taking her to that Japanese man.. I like everything except the ending of the stories, which i prefer that finally they both can be together, dayo and cecilia. I think comedy and happy ending will bring more joy to audiences these days, as many of us moved away from sad movie that will effect our daily emotion, so happy movie is more popular now. I got 3 more episodes to go and i will be finished. the chemistry between cecilia and dayo was like interesting and their scenes were fun to watch. A very witty series ^^, enjoyed watching it heaps. Before watching this series, I never really liked Dayo…but now, he’s alright :P.
Like what bibi said, would’ve preferred a different ending. Part two anyone? lol..part 2 as in a sequel? I would love to see more Dayo! 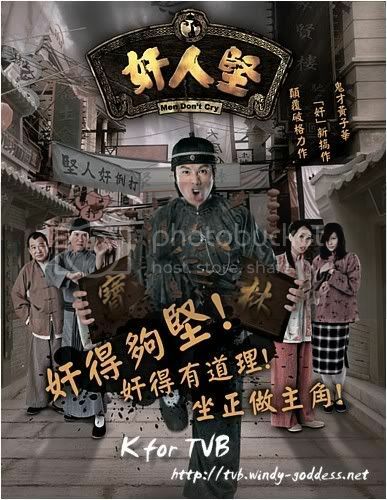 XD But a Sequel is highly unlikely since it wasn’t well received in Hong Kong which is a shame. (And the characters have gone older now). I really wanted Dayo to be accepted in society but at the end it does prove to be difficult considering all the “trouble” that he brought to everyone in the past. Even if Wong Fei Hung was there to clear his name, things just wouldn’t revert like that. one of the most funniest series i watched. Dayo is the best in comedy. I love his facial expressions. Did anyone watch his stand-up comedy shows? They’re so funny. Yeah… making him die on the day he has to take wedding photos was so sad! It’s a very nice drama. haha. But do u have the song for men don’t cry? i really like his singing. thanks. i wish there would be a part two for men don’t cry as you could talk about waht happenedto gum cheen pao and what happened to cecilia after she didn’t want to go back with wong fei hung to po chi lum. the only one reason y i watch this drama..